I’ve been on a comics bender lately. It’s kind of a combination of reasons, really. I’m having technical difficulties with one aspect of reality at the moment. My response to such problems has always been to pull away, to sequester myself away from whatever it is that’s bringing me down, usually within the safety of one of my many geeky obsessions. Healthy? No, probably not. Enjoyable? More so than what’s bringing me down. Also, when I do finally reconnect myself to reality, I feel a little better and a little more clear-headed. Other reasons? Well, I’m sure I’ll write about it later (read: in my next book review), but I’m totally crushing on a new geek obsession. Crushing hard, denizens. Like Star Trek-level crushing. Like “probably (definitely) driving people who know me in other realms on teh Interwebz crazy” crushing. And it’s connected me back to one of my earliest geek obsessions: comics. Believe it or not, I used to be quite the comics nerd (no, Loba, we could never imagine you being EVEN NERDIER THAN YOU ALREADY ARE!). Not like Comic Book Guy-level, but I started down a comics obsession path around the same time as my Star Trek obsession started. Turns out, though, that I only had enough focus for one critical-level obsession at a time. Star Trek won. Comics simmered on the back burner. Until the past few years. I have several friends who are hard-core comics fans. Their knowledge drew me back out of curiosity. Reading what they were writing elsewhere about certain comics piqued my interest and showed me pathways that I hadn’t known existed previously. Pathways that greatly appealed to me. Plus, there have been some…interesting changes to some characters (coughcough Batwoman coughcough) that lured me deeper into the darkness. Darkness has always drawn me in. But then there is Darkness. Injustice: Gods Among Us? That’s some serious darkness, my friends. Surprisingly dark, to be honest, from what I expected to be a fun but empty introduction to a video game. That’s what this is: a graphic novel written as a companion piece to a similarly named video game. I don’t even remember how I ended up learning about it, but when I read the description, it sounded like something I would enjoy for its welcome escapism. I did enjoy it, but for much deeper reasons than I ever anticipated. This is one of those alternate universe stories in which recognizable and (overly) familiar characters take paths that skew far afield from what we know them to take in “reality.” For this, the primary AU character is Superman. I’ve spoken at length about my feelings about where they’ve gone in recent years with Superman: making him emo and (IMHO) whingy about being all-powerful. Oh, and funky dark. I don’t like funky dark. However, for this novel, they take Superman down a dark and twisted path that…honestly? It works. It works shockingly, brutally well. You have no doubt that the catalyst they use would absolutely work the way it did to cause Superman’s…change. Which actually isn’t a change of personality but instead a change of approach. As you can tell, though, I don’t want to give away a whole lot about the story. It’s full of enough surprises and twists that I would hate to ruin this for anyone. I will say that it was great to see so many DC Comics heroes used throughout this first volume. Some I know a lot about. Some I know a little about. Some? Some I’m getting to know better right now, so it’s interesting to see this take on them in comparison to who they are where I’m seeing them elsewhere. The heart of Injustice is the DC Triumvirate: Superman, Batman, and (to a lesser degree) Wonder Woman. I have mixed feelings about Wonder Woman’s role in the story. I’m hoping that her role will shift with time. Batman, however, is surprisingly…sane. And while still intrinsically grave and untrusting, he’s also likeable (in his own way). Likeable, too, is the relationship built between Superman and Batman in this story. It’s far more complex than I was anticipating from this novel. Obviously, I greatly underestimated writer Tom Taylor. Also? The artwork is exquisite throughout. Jheremy Raapack and Mike S. Miller provided artwork that could rival Williams, Perez, Ross. Fantastic. Final Verdict: Definitely keeping. Definitely checking out Year Two. Apparently, they’re all the way up to Year Five now? I don’t know if I will stick it out through the whole series, but this hooked me tightly enough that I’m antsy to see where it will go next. 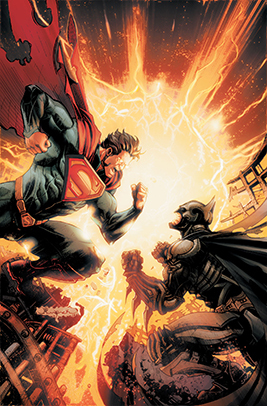 If you are a DC Comics fan, then I would highly recommend you give Injustice a proper go. I have a feeling you, too, will be pleasantly surprised. You know me, denizens. I lurves me some drag queens. I know, some prefer the term “female impersonator.” Some prefer “gender illusionist.” I take all this into account and I respect it. However, in this particular instance, it’s definitely drag queens. Two, to be precise: Mitzi Del Bra and Felicia Jollygoodfellow, along with their transsexual friend Bernadette Bassenger. 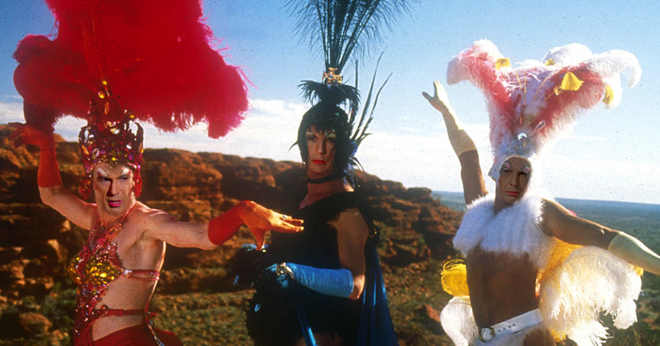 Seems they have a gig to perform their drag show in a remote part of Australia, far from their Sydney home base. The only reason that Mitzi would even consider traveling so far and to such a questionable location is because the hotel manager is…special to her. So they pack up their kits (which include lots of makeup, lots of shoes, lots of wigs, and lots of the most elaborate outfits imaginable) into a giant bus they christen…what? Priscilla! 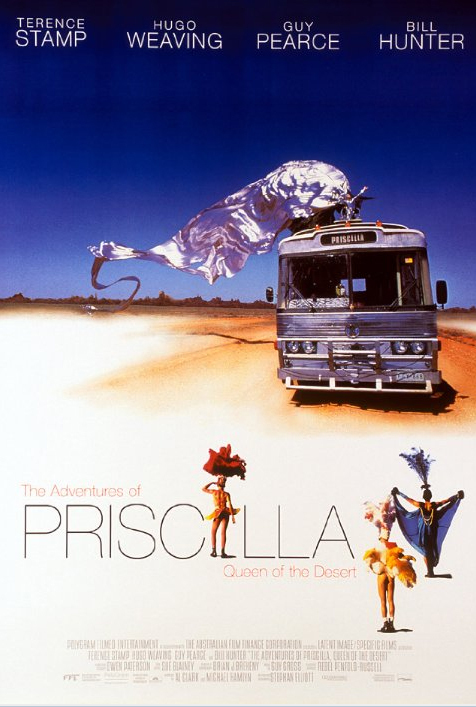 And thus begins The Adventures of Priscilla, Queen of the Desert. This is a relatively bare-bones explanation of this movie’s plot. It’s kind of hard to give more, because if you haven’t seen it, the descriptions aren’t really going to make much sense…and if you have seen it, you’re going to understand completely what I mean with that last statement. I can tell you all the details in the world, but it’s not going to be even remotely close to actually experiencing this movie. Which I highly recommend you do, at least once. Then you too can immediately laugh along whenever you hear someone mention this movie and ping pong or blow-up doll kites or ABBA poo. Or Ralph. Me? I’ve seen this movie all the way through more times than I can tally (although I know it’s well into the double digits), and way more than that in bits and bobs whenever I catch it on television. Beyond being hilarious and riotous and strange and delightful, it amuses me to no end that the three leads each have found varying levels of fame playing characters utterly opposite from these lovely ladies: Mitzi later became Agent Smith, the ultimate foil to Keanu “The One” Reeves in The Matrix; Felicity would later forget her drag days along with every thing else as Leonard in Memento; and Bernadette once brought Christopher Reeve’s Superman to his knees as General Zod (back when Superman wasn’t mopey and pewey). It blows my mind a bit that this movie came out 20 years ago this year. All three actors have gone on to do myriad performances beyond these characters, and still these are the roles I think of first whenever I see them. These are the roles I love them for the most. I know there’s a musical based on this movie. I haven’t heard any of the music. I kind of don’t want to. The movie amuses me so much in its own right, I don’t really need to see another take on it. Besides, it has to be Australian. In Australia. With Australian actors (and Bernadette Zod). And not terrible fake Australian accents. Call me a purist, but I need my Oz fix, dammit. As a special treat, I’ve come up with the following bit of PhotoShop fun. I call it Three Spocks in Frocks on a Rock. If you don’t get the pun, you now have another reason why you need to watch this movie. You’re welcome.